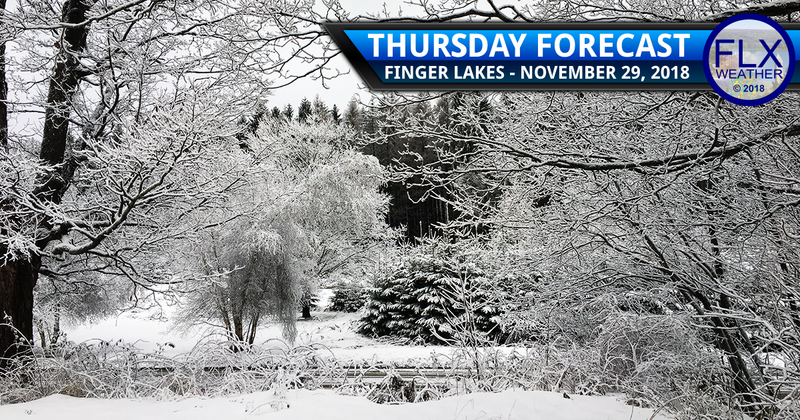 Snow showers will linger across the eastern Finger Lakes Thursday morning before ending. A little snow will fall Friday, followed by rain and warmer temperatures this weekend. While the threat for heavy, accumulating snow is over, flurries linger over parts of the Finger Lakes this morning. Cool northwest winds persist this morning, leading to a spray of flurries, especially to the east of Cayuga Lake and into Central New York. Most of these are not even showing up on the radar. A fluffy coating to an inch may fall. The rest of the region is cloudy but quiet this morning and will remain so through much of the day. A brief glimpse of sunshine cannot be ruled out, especially during the afternoon hours. Temperatures range from the mid 20s to the mid 30s this morning and will only rise a few degrees today. Winds will be much less than yesterday but still breezy in rural areas of Central New York. Winds will become mostly calm this evening and through the overnight. Temperatures tonight will drop back into the mid and upper 20s for most areas with a few low 30s near Lake Ontario and the larger Finger Lakes. Winds will turn towards the south Friday morning as a small system approaches. Temperatures will warm to near or just above the freezing mark by midday Friday as some light precipitation moves in. This should fall as snow with a coating to perhaps an inch falling, mainly across the Southern Tier. Northern areas may not see any precipitation at all. By the mid-afternoon Friday, the area should be dry and will remain so for about 24 hours. A warm front will then move into the Finger Lakes for Saturday afternoon and evening. Temperatures aloft will warm above freezing quickly Saturday morning, but surface temperatures will be slower to warm. At this point though, the precipitation should not arrive until after temperatures make it to the mid 30s. This will keep the precipitation all rain. Finger Lakes Weather’s new seven-day forecast graphic showing the forecast for the weekend and early next week. 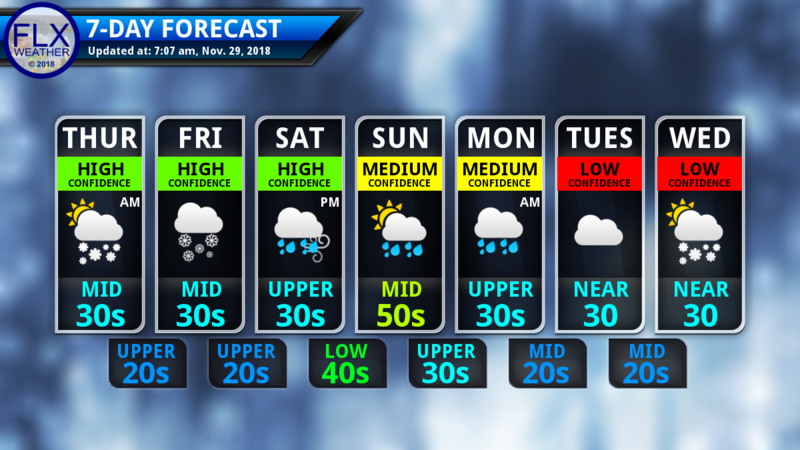 This style graphic will soon replace the old 7-day forecast on FLXweather.com. Click to enlarge. Should the rain make it in before temperatures warm, some patchy freezing rain could fall at the onset of the precipitation. This is not expected to occur at this time but is something to watch closely. Temperatures will rise Saturday night, going from the upper 30s Saturday afternoon to the mid 40s by Sunday morning. Gusty south winds and rain will accompany this warm up, but the rain should end by morning and winds will drop for Sunday. Sunday afternoon should then turn sunny and very warm. High temperatures will range throughout the 50s with low and mid 50s across the Southern Tier and mid to upper 50s in the northern counties. Rain showers will return Sunday night into early Monday, ushering chilly air back into the region. Temperatures Monday will fall with mid 30s by the late afternoon. Next week will remain chilly with a chance for lake effect towards the middle and end of the week. Never miss an update from FLX Weather by subscribing to new blog posts! Subscribing is easy, free, and secure! Note: Subscribers who signed up for email before November 2018 need to resubscribe to this new list.